With these tips in mind, you can tackle your high work load without stressing yourself out completely. Remember: There is no single formula for what works for everyone. Find what works for you, and you should see success. We all have busy periods at work--the times when work is piling up and you can't avoid it. 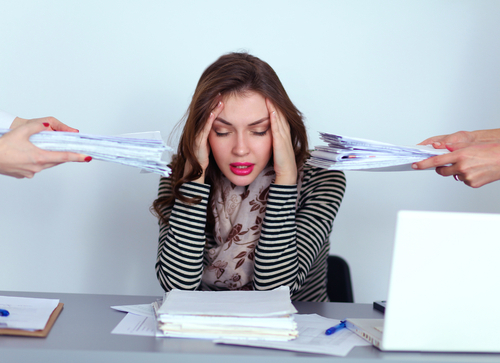 However, there are techniques you can use to combat the stress of a busy workload. Below, we take a look at how to manage stress during busy periods to help you lead a more balanced work life. If you work in the type of industry where you can predict your "busy season," plan for a break before and after the hard work hits. A couple of days off beforehand can help you clear your mind and come into work refreshed and ready to take on the tough workload. Don't forget to take short breaks throughout the work day, either. Even a five-minute break to go to the bathroom or get a drink can help you clear your mind. Also, make sure to get away from your desk during lunch time. This can help you relax and recharge for a more productive afternoon, but unfortunately, only one in five people actually step away from their desk for lunch. You already have this break scheduled into your day, so why aren't you taking it? If you can reasonably afford it, consider outsourcing certain tasks. For example, you might hire a teen in the neighborhood to mow your lawn or rake your leaves during your busy periods at work. Put other commitments on hold, and ask someone else to cover your tasks during your busy season. This can include community or religious commitments. Limit your screen time. Although certain online activities can help reduce stress, heavy technology use is actually linked to higher stress levels, so you might consider alternative forms of stress relief. Although you'll want to cut down on certain tasks in your life, exercise should not be one of them. Exercise can reduce stress and improve productivity, yet it's often one of the first tasks to go when your life gets busy. Walking or biking to work instead of driving. Using "deskercise" techniques while working. Incorporating exercise into other activities, like family time (play an active game together) or when watching TV. Aside from getting your exercise in, you can't forget to take care of other aspects of your body and health. If you aren't attentive to it, you'll only become more stressed and burnt out. Start by making healthy food choices. With small, frequent meals throughout the day, you will maintain an even blood sugar to help keep you focused and energized while avoiding irritability. Don't forget to get plenty of sleep at night, either. Stick to a routine, and aim for eight hours of sleep per night. If you don't give yourself time to recharge, you'll only wake up dragging your feet and performing poorly at work. Shutting down your workstation an hour earlier and taking that time to sleep can mean a more productive workday tomorrow. In the end, you'll end up getting more done while feeling less stressed. Some people are more naturally productive during the early hours of the morning. Others get more done late at night. Find when you're most productive, and work during these hours (if your boss allows for the flexibility). Working when you're least productive is futile. It will only stress you out more without getting much done. It's not about how many hours you work; it's about the work you complete in the hours you do work. Even if it's just five or 10 minutes per day, you need to take a breather. Unplug, and engage in an activity that helps you relieve stress--whatever that is for you. You might read a book, take a bath, play a game on your phone, or enjoy a short yoga session. The idea is to let go of your stress so that when you return to work, you can work more productively. It's okay to work overtime when you have a lot of work to do. What's not okay is only working through these high-stress times. The more you work, the less productive you become throughout the week. You need a break. By the time you hit 56 hours in your work week, your productivity steadily declines. Research shows that whether you work 56 hours or 70 in a week, it didn't really matter because the output of the work is approximately the same. Essentially, you're wasting those extra 14 hours if you try for a 70-hour week. Furthermore, another study showed that managers couldn't tell the difference between workers who spent 80 hours per week working and those who just pretended to, but they did punish those who admitted to working less. Overworking doesn't necessarily mean you accomplish more. Once your busy season is over and work slows down, set aside some time--even if it's only 15 minutes--to reflect back on what worked and what didn't work for you during this high-stress period. Outline how you'd like to tackle the issue next time, and you'll be prepared for when work volume increases again.